Check out Adelante’s New Website! 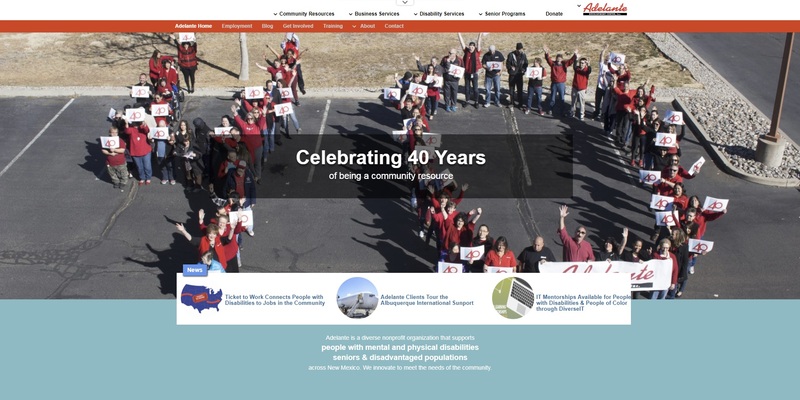 Adelante is proud to reveal a website renovation that captures our expanded mission on behalf of people with disabilities, seniors, and people with disadvantages. There are big changes and lots of information on www.GoAdelante.org. Specifically, you’ll find lot of community resources, information on our businesses, and more details on our disability and senior services, including our new senior homes. We want to offer a big thank you to our internal teams from App Dev and Marketing that completed the work. Additionally, thank you to everyone at Adelante who served as our content experts, making sure the information was correct. Continue to check back because there will be new stories from around the agency every week. Above all, Adelante welcomes feedback from all users about the new site. What would you like to see added? Do you have story ideas? Is there something you found hard to find? Please let us know by emailing us at info@GoAdelante.org.